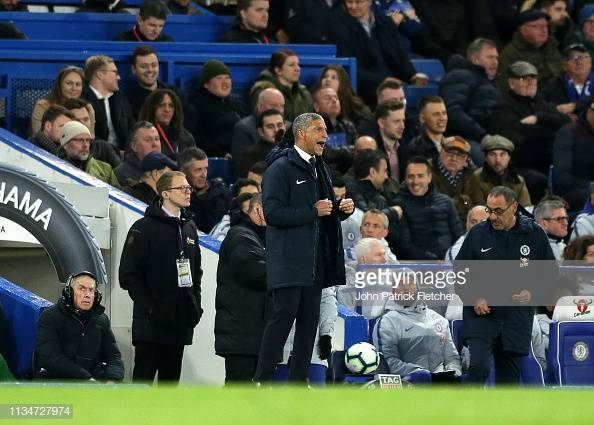 Chris Hughton in the dugout at Stamford Bridge last night. Image courtesy of John Patrick Fletcher on Getty images. The Brighton manager could not fault his team's effort in the 3-0 defeat to Chelsea. Brighton & Hove Albion manager, Chris Hughton could not fault his team's effort in the 3-0 defeat to Chelsea. Hughton had the following to say on the performance: “I thought we showed a great attitude today, which we had to do, but sometimes the quality they’ve got and the amount of times they get into [dangerous] areas can wear you down. One area Brighton struggled in was creating chances with them only having three shots during the whole game, two of which were on target: “We needed to show more [going forward]. There were a lot of moments where we broke well, but what the likes of Chelsea and the top six do is work very hard," Hughton said. “One part of their game is the quality that they show on the ball, but when the opposition have got the ball and breaking, they work hard to press and get back in numbers. “Anthony Knockaert probably had our best opportunity of the game right near the end — so it certainly wasn’t a case of us giving up, which is important going into the weekend." Brighton remain five points above the relegation after Manchester City beat Cardiff City 2-0 at the Etihad stadium last night. Hughton thinks that their fate in still in their hands: “It’s going to be a battle — there isn’t any team around us that isn’t fighting hard. We saw Cardiff run a very good Chelsea side close at the weekend.